Lithuanian President Dalia Grybauskaitė's picture accompanied by a note that she passed away four years ago was featured in the TaneXpo funeral service biennial in Italy by a small Italian family-owned printing services company MaxiCard. When the company learned that they had accidentally used a picture of a president for their advertisement and that the news has reached Lithuania, they closed their booth early at the international exhibition in Bologna over the weekend. “We usually use our family photos, but they did not look attractive enough for our son and offered to look for a more beautiful one. At the time I was very busy and I left the matter to him. When I saw that picture, I really enjoyed it. Your president is very beautiful woman,” said Ivo Schiavon, owner of the company. 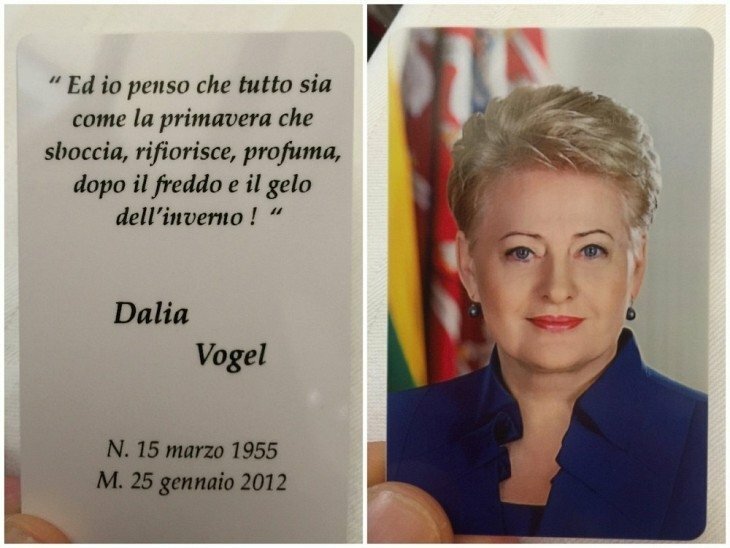 Next to Grybauskaitė's image, in which she is called Dalia Vogel, the Italians had added a fictional birth and death dates and a few poetry lines. “I assume full responsibility and apologize to the President and all Lithuanians, sorry if I hurt someone's feelings, it happened not from a bad will. I do not know how else I could apologize,” wrote I. Schiavon in an apology to Lithuanian Embassy in Italy, which demanded it remove the photos. It seems that the Italian company did not suspect it would draw international attention by borrowing a picture from the internet for their promotional stand.